DVD copy software allows you to copy DVD movies to your computer or to another DVD. As well, DVD copying software is used to convert DVD movies for playback on media players or mobile devices such as iPhone, Ipad, Apple TV, Archos, Creative Labs Zen, Microsoft Zune and Sony PSP. Copying movies is easy if you have the right software. There's so many DVD movie copying software programs available, determining the best the best copy DVD software can sometimes be frustrating. One of the most important things to consider when looking for DVD copy software is to ensure it has regular updates so it's able to copy new movies. Some copy programs only allow you to copy to a hard drive; if you want to copy DVD to DVD, you need to make sure the copying software has burning capability. If you want to copy DVD movies to DVD, or copy movies to your computer hard drive, 1CLICK DVD COPY is exactly what you need. 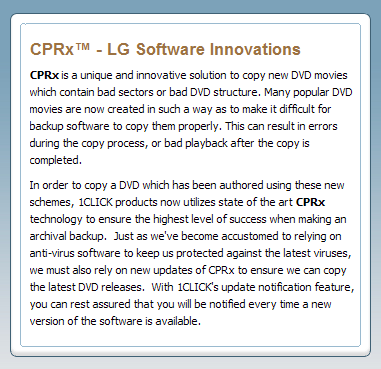 1CLICK DVD COPY has burning capability (for DVD to DVD copying) as well as regular updates. 1CLICK DVD COPY is a fast and easy to use DVD copy software program. It utilizes CPRx error correction technology to ensure the highest level of success when copying the latest movies and makes a perfect copy of a movie with just one click. Copying movies is easy with 1CLICK DVD COPY. If you want to watch your movies on media players or mobile devices (iPod, etc.) you need DVD copy software that converts DVD's. 1CLICK DVDTOIPOD converts movies and television episodes to video files for the iPad, iPod, iPhone, Apple TV, Archos, Creative Labs Zen, Generic DivX, Microsoft Zune (MPEG-4) and Sony PSP. It's easy to convert all your movies with just one click. Movie and episode detection is automatic; just click the Start button and return to find your DVD movie converted.